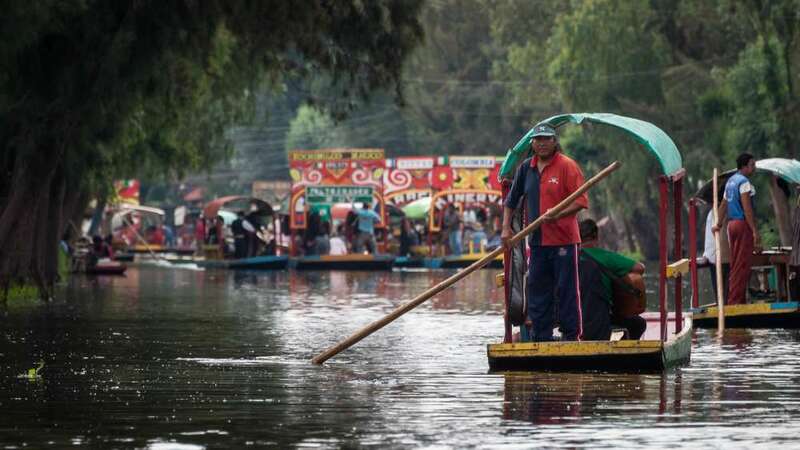 This 170 square km ancient Aztec canal way is on UNESCO's World Heritage list and today is a popular place for Mexicans to throw a riverboat party with food, pulque and live music, all delivered by boat. Mexico City is the second-largest city in the world with its population of 21.2 million. So it’s kind of a surprise to find this lush network of canals feeding off of its southern edge in the borough of Xochimilco. 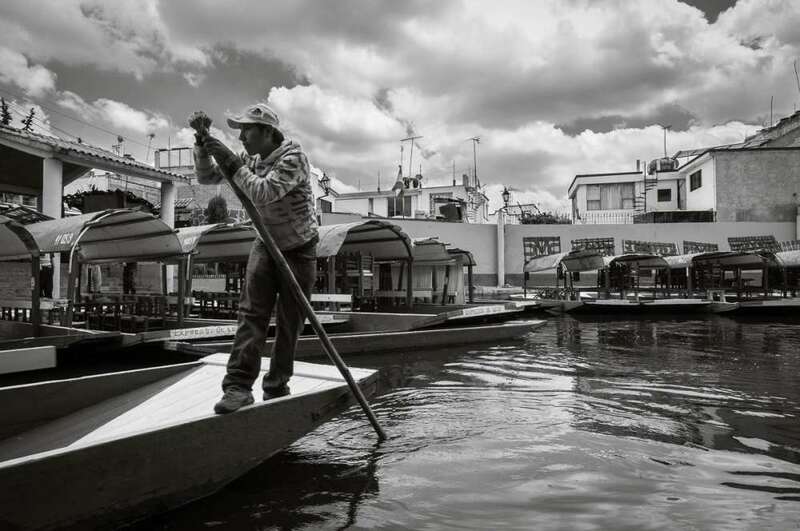 Before the Spanish arrived in the 16th century, the town was a small center on the southern shore of Lake Xochimilco. The 170 square kilometers of canal ways is all that remains of the lake, which today has been swallowed up by the federal district. 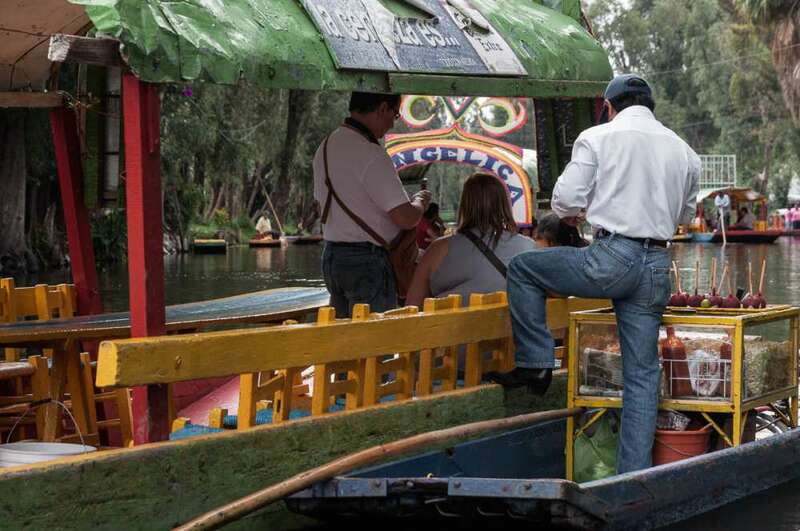 Tourists, many from Mexico City, come here with friends and family to board colorful boats called trajineras, which are pole-operated crafts that originated at Xochimilco. 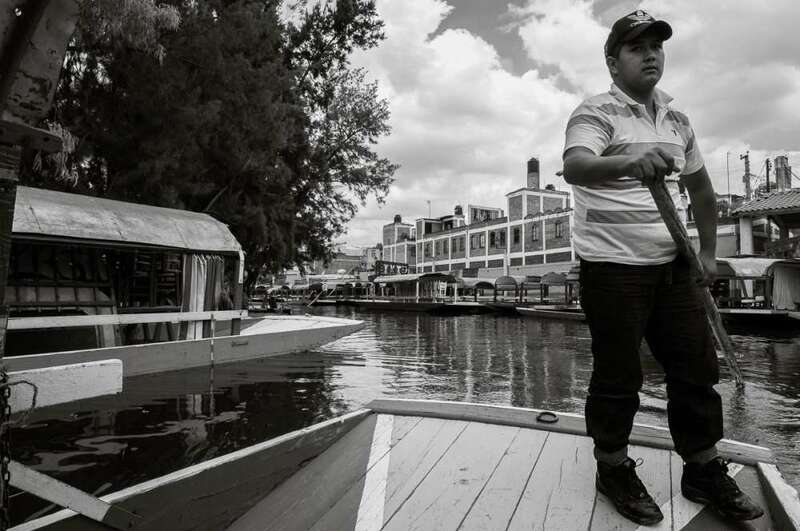 The canals can be crowded, especially on Sundays, with trajineras jostling for position; vendors selling pulque, food, and snacks; and musicians traveling from boat to boat playing mariachi, banda or marimba tunes. Xochimilco gets its nickname “floating gardens” because of the unique system of chinampas agriculture developed here in pre-Hispanic times which allowed farmers to grow crops on plots of land they had built in the lake. Its unique history has earned it a spot on UNESCO’s World Heritage list. 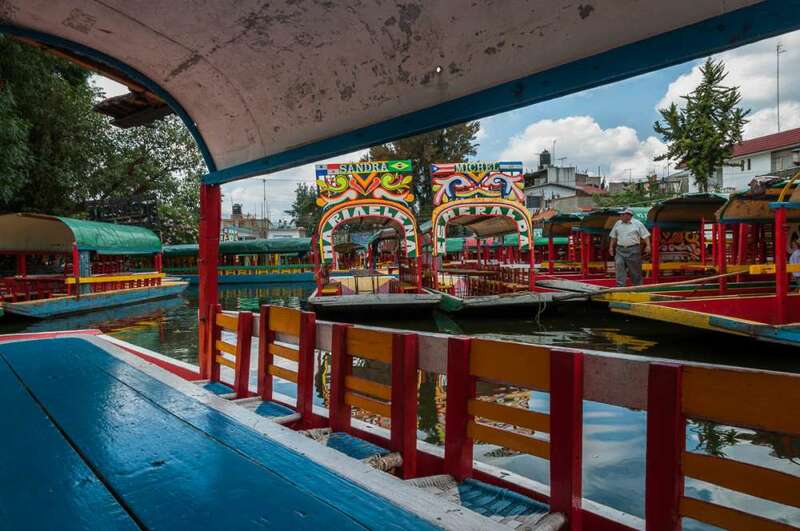 Xochimilco’s famous colorful boats have their own name, trajineras, which comfortably fit about two dozen people around a long central bench. The boats are propelled by a pole operator, who will take you around the canals. This girl was commuting by boat either to or from school at Xochimilco. The canals sometimes get a bit tight, but everything works out in the end. The man with the case was going boat-to-boat selling jewelry. 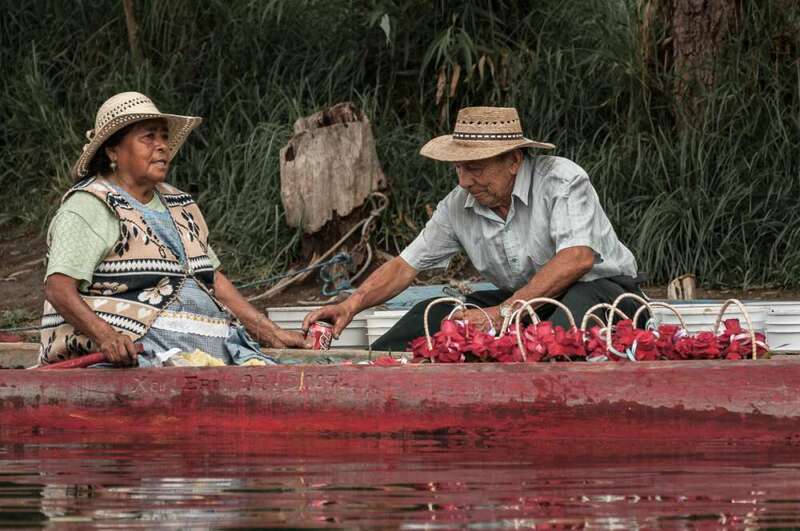 A couple working at Xochimilco takes a break, sharing a coke along one of the canals. Boatside food and drink service is standard. 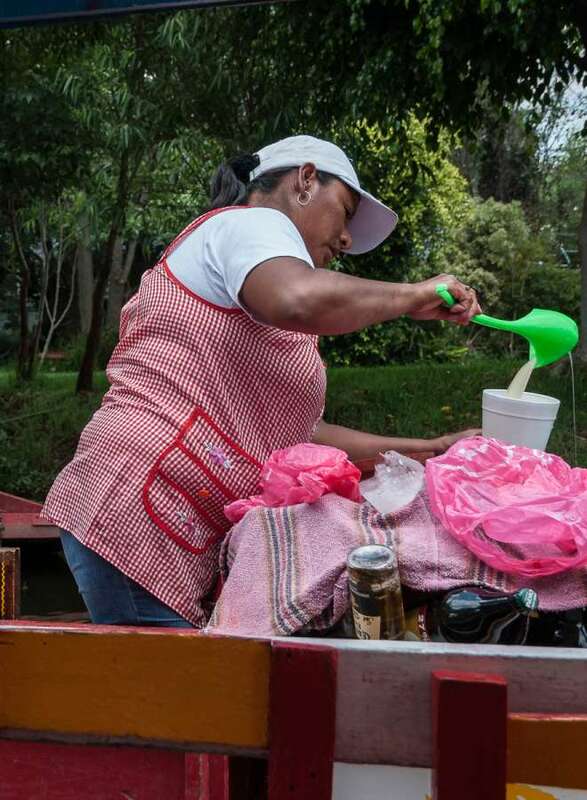 This woman cruises in a small boat from trajinera to trajinera offering drinks to visitors. Here she is pouring out a cup of pulque, a traditional fermented agave drink that was especially popular in Mexico City pulquerías in the 1800 and 1900s. 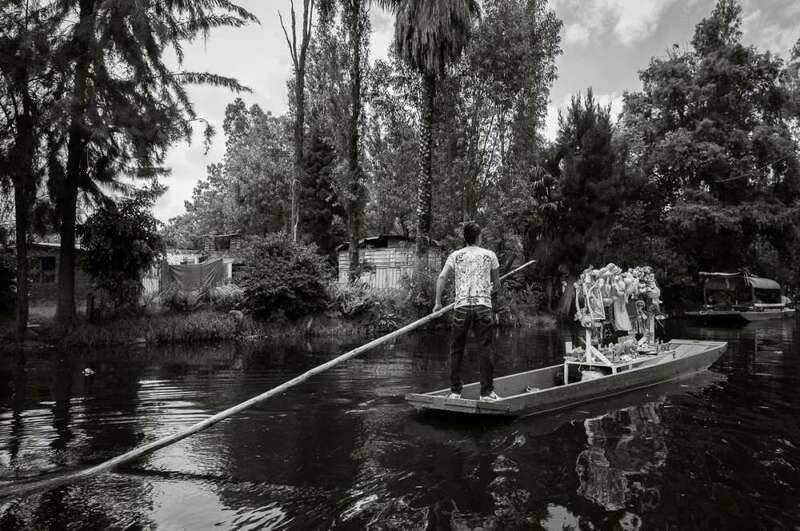 A man sells snacks from his boat to visitors at Xochimilco. 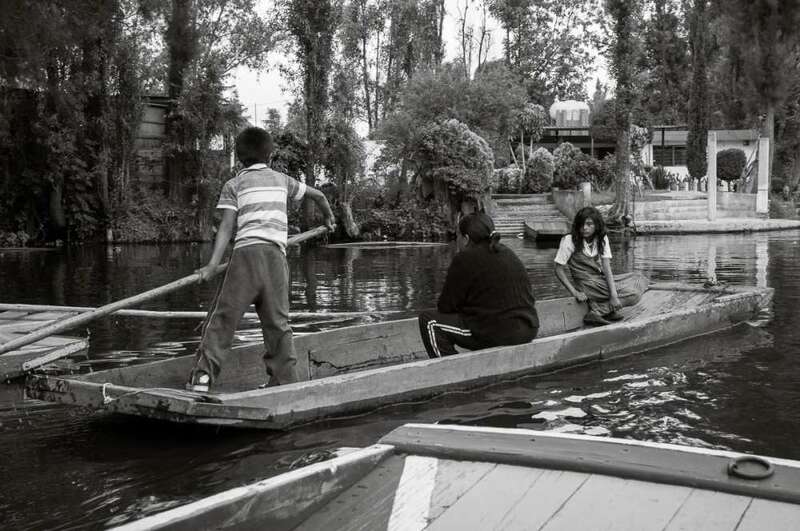 A girl operates a trajinera boat a Xochimilco. 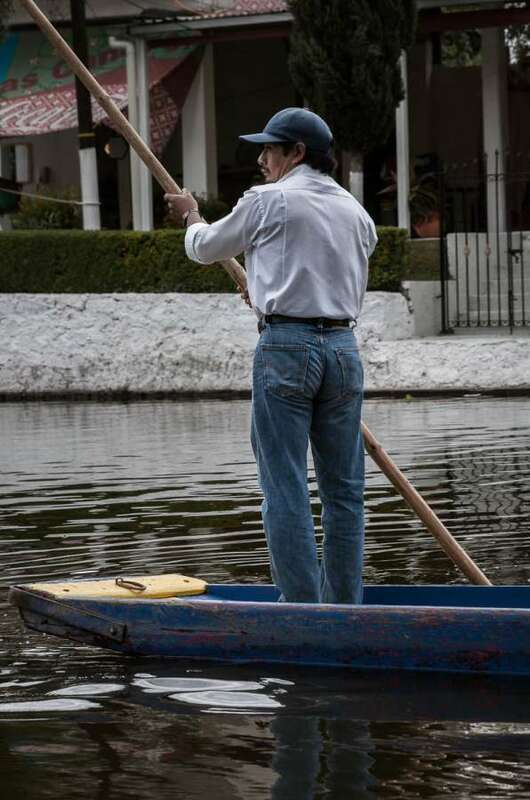 A man pushes one of the pole-operated boats at Xochimilco’s floating gardens. 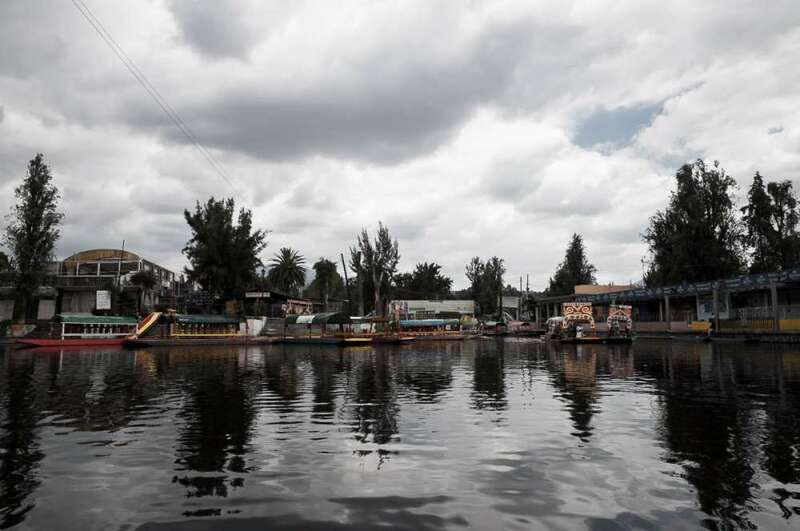 Mexico City is often overcast in the summer and the waters at Xochimilco are usually calm. 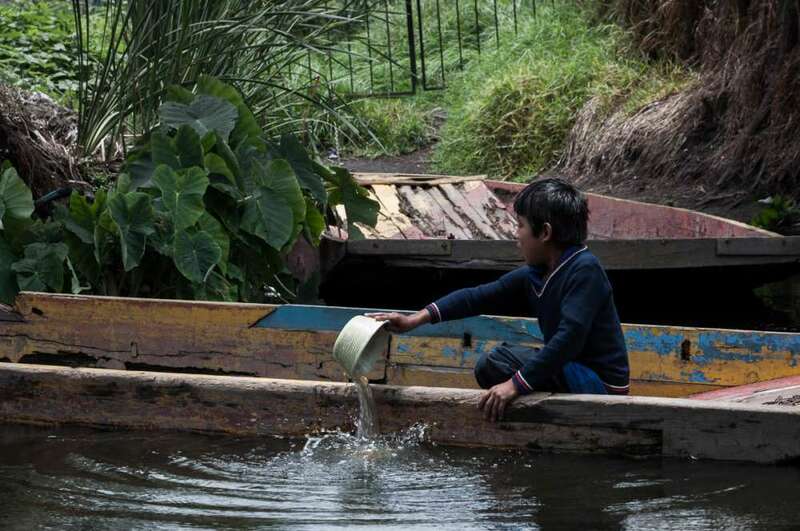 A boy empties the water from his boat before pushing away from shore. The summer rainy season can sometimes dump a couple inches of rain during an afternoon rainstorm. Some of the trajineras are given names, of the decorator or a girlfriend. 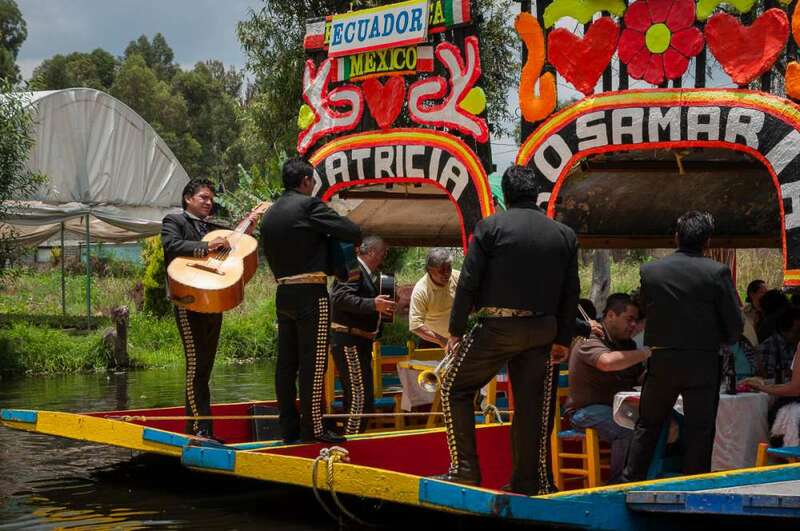 Musicians wander the canals in smaller boats, boarding the trajineras after being hired to play some songs — usually more than a few, for the passengers as they eat and drink during the afternoon. 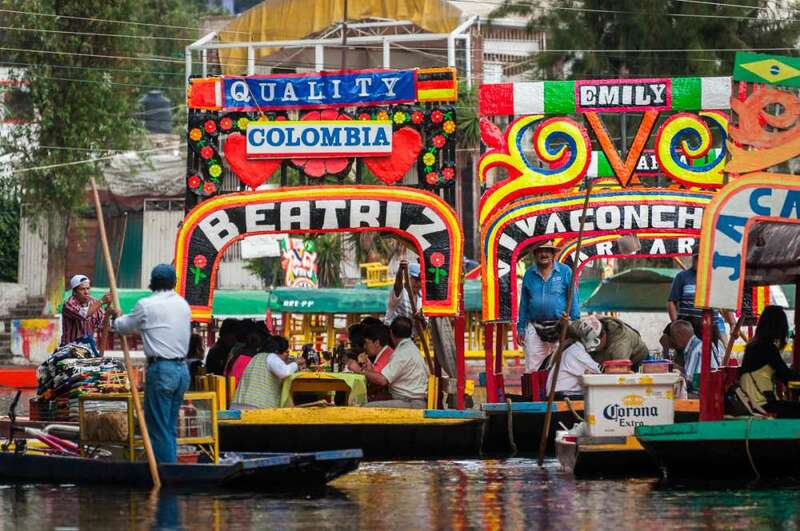 Here, a large group has tied their boats together as they cruise through Xochimilco’s canals. 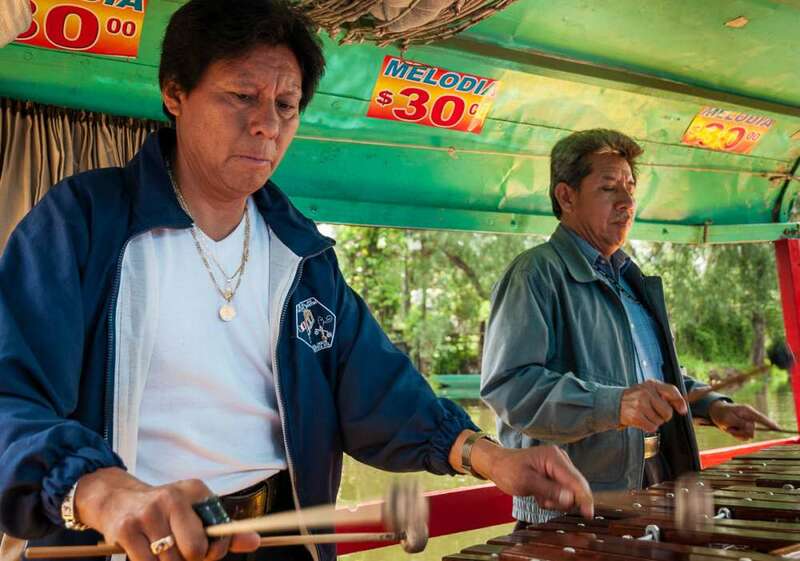 Musicians double-up on a marimba to play for $30 pesos a song. 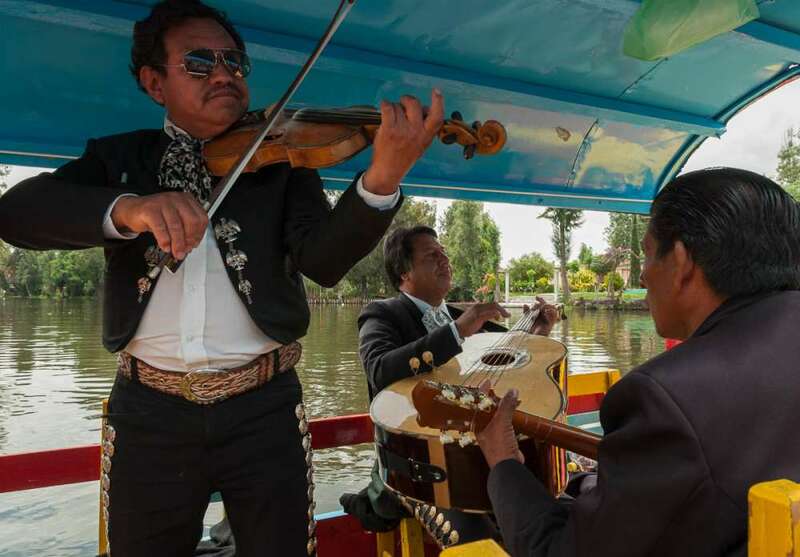 A mariachi group plays “Las Mañanitas” at Xochimilco, in southern Mexico City. 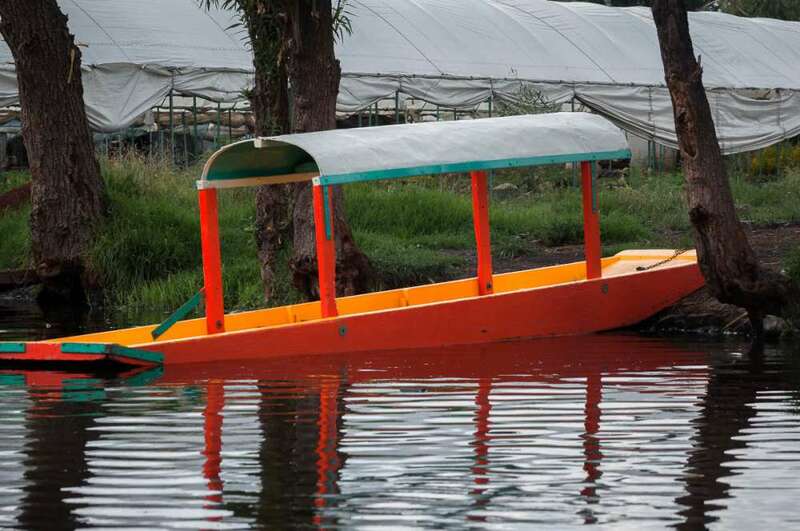 One of the colorful boats at Xochimilco waiting for passengers. A headless doll hangs from a tree on the Island of the Dolls at Xochimilco. 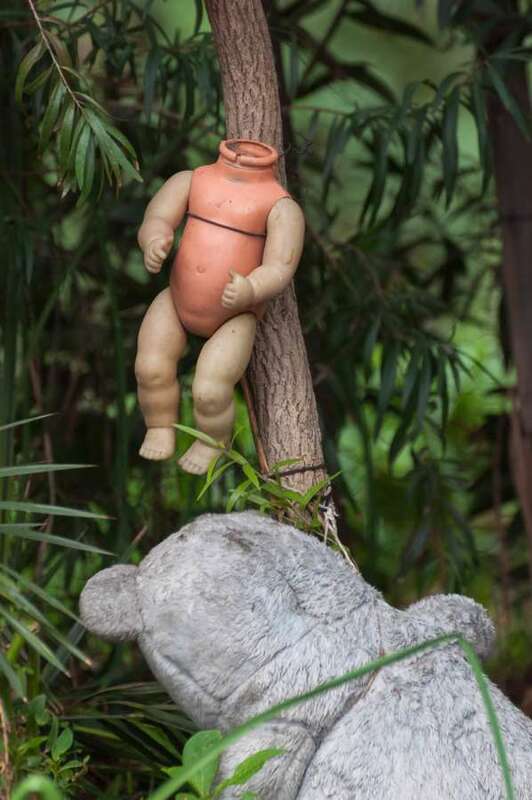 It is one of the hundreds of dolls brought to the Isla de las Muñecas by Julian Santana Barrera, a hermit who supposedly found the body of a girl floating in one of the nearby canals 50 years ago. 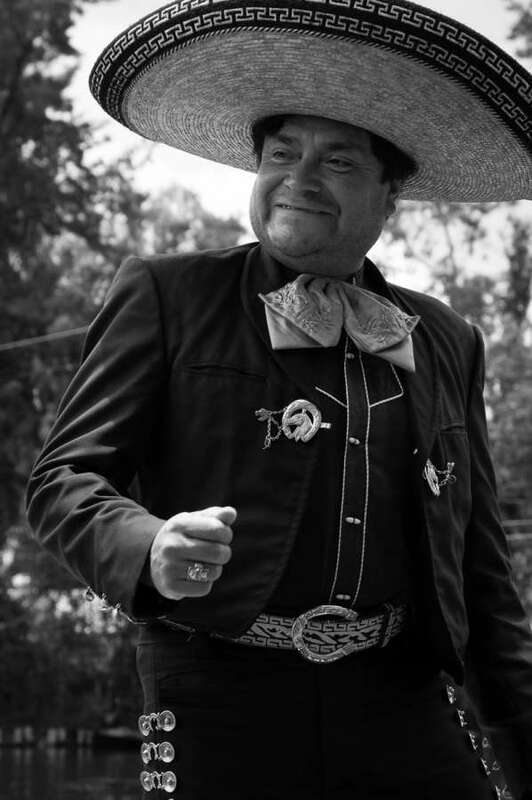 Barrera died in 2001 and the island is now run by his family as an attraction. This young man selling knick-knacks seemed to prefer using a long pole to propel his boat through the canals. 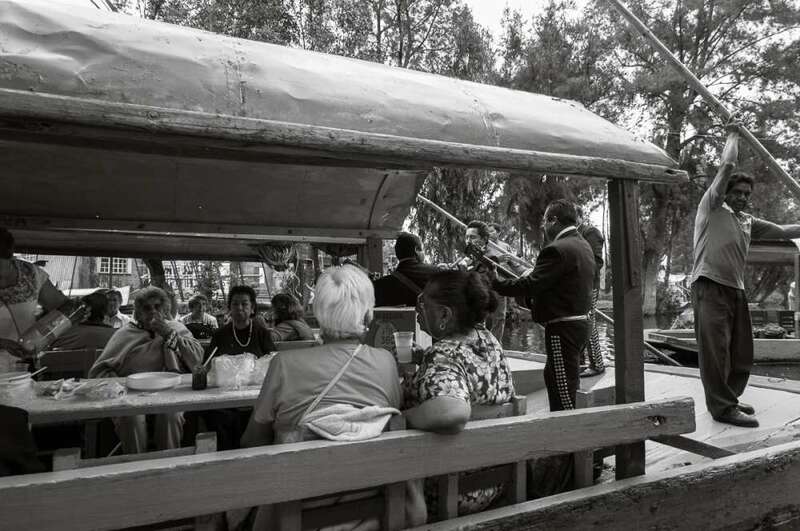 Not everyone who comes to Xochimilco is a young college-type looking for a chance to get drunk on a Sunday afternoon… these madrecitas do it, too! 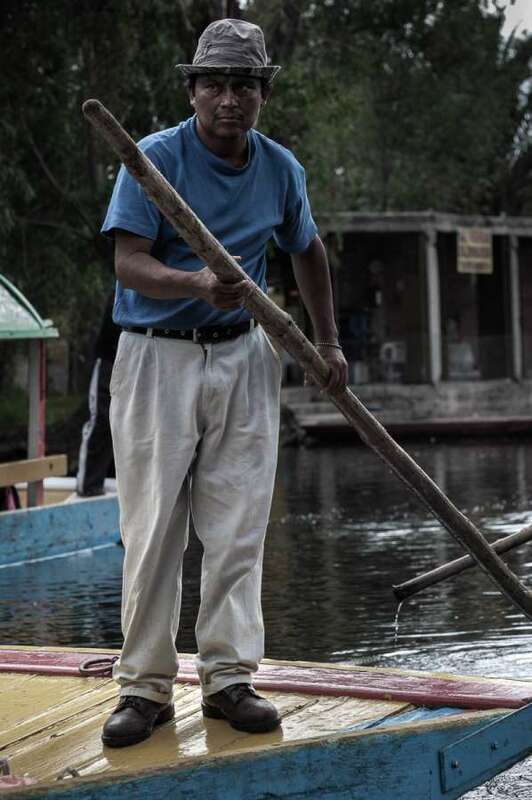 A trajinera boat operator using a pole to push his boat through the canals at Xochimilco. 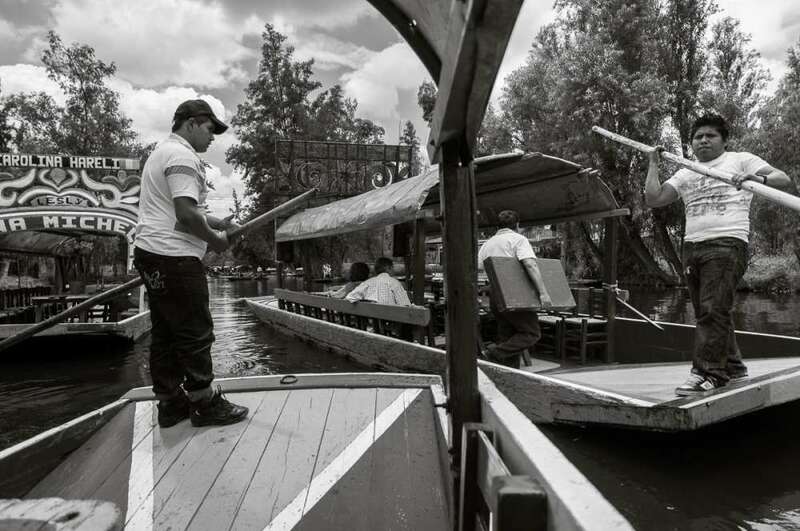 A man operates a trajinera boat along the canals of Xochimilco’s floating gardens.